How many times have you heard a student say “I didn’t even know the school had an office like this,” or something similar? It’s not uncommon that students spend most of their time in college without the knowledge of career services on campus. Students are often more focused on their classes, exams, and projects and aren't thinking about their search for a job in the next two, three, or four years. As career services professionals, make sure to find opportunities to explain to students how important these services are and encourage them to spread the word to their friends and classmates. Unfortunately, not all students realize the amount of work or dedication it takes to find employment. There are lots of students who have never had a job before, and this is their first step in finding a place in the working world. Because this can be a new venture for some, it is often incorrectly assumed that career services professionals do a majority of the legwork and place students in jobs. Hopefully, this misconception is cleared up in the first meeting or phone call to prevent any confusion. Depending on your position in the career services office, you may find career fair season more or less stressful. No matter what your title is, however, all career services professionals are familiar with the preparation, execution, and wrap-up of hosting career fairs. Whether you’re charged with finding the venue or just spreading the word, career fairs are a crucial part of a career services professional’s work. As graduation creeps closer, students’ anxiety about going out into the “real world” starts to build. Career services professionals can all relate to working with an anxious student who worries about not being able to find a job. Luckily, you’re ready with the tools and resources to ease their concerns. 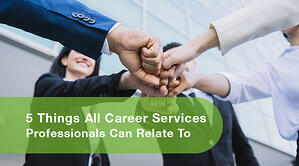 Sometimes it can be frustrating to work as a career services professional. There are a lot of challenges that come with the job. However, the fifth and most rewarding thing all career services professionals can relate to is the sense of fulfillment and the warm, fuzzy feeling you get inside when you help a student land a job. Their happiness and accomplishment are what the profession is all about!